Welcome to the 320th MMS Home Page! You've reached the home page for former members of the 320th Munitions Maintenance Squadron. This site includes a directory of former personnel, reunion news, links, history, and photos. 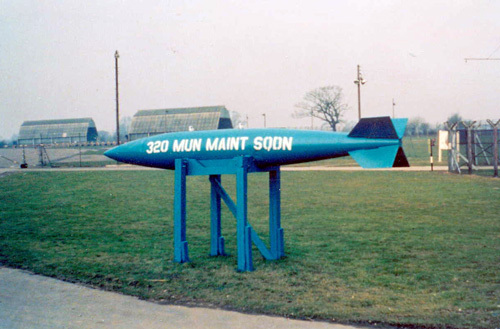 320 MMS served as part of the 20th Tactical Fighter Wing (TFW) at RAF Wethersfield, Essex, UK. The 20th TFW was part of the 3rd Air Force at the time. The mission of this site is to serve as a meeting place for the personnel of the 320th where they can reconnect with each other and share memories. If you're a veteran of the 320th, we'd like to get you on our list of personnel. Just go to our registration page and fill out a short form. Once you are approved, you'll have access to all the member-only features of the web site. If you have photos, memorabilia or stories about your time at the 320th, we hope to make this web site a place where these can be shared. If you have suggestions about the site, please contact us. The "U.S. Air Force Blue"